As a term used to denote the ability of defence systems to collaborate, interoperability has emerged as one of the most important capacities of information systems, during the last 30 years. Being important at organizational, process and semantic levels, interoperability soon became a key characteristic of information systems and services, both in the private and public sector. As a crucial prerequisite for automated process execution leading to “one-stop” electronic services and promising dramatic increase in productivity for enterprises of any size, interoperability has been systematically sought after, since the dawn of the 21st century: standardization frameworks, guidelines at enterprise level, data schemas and techniques to tackle the problem of non-communicating systems or organisations started to appear. In parallel, most international software, hardware and service vendors created their own strategies for achieving the goal of open, collaborative, loosely coupled systems and components. This chapter goes beyond the presentation of the main milestones in this fascinating quest for collaboration between people, systems and information: it attempts to describe how this new interdisciplinary research area can transform into a vibrant scientific domain, by applying the necessary method and tools. To achieve that, the chapter presents the ingredients of this new domain, proposes its needed formal and systematic tools, explores its relation with neighbouring scientific domains and finally prescribes the next steps for achieving the thrilling goal of laying the foundations of a new science. Interoperability appears as a key enabler towards unlocking the full potential of organisations, processes and systems in the public and private sector. Since its inception as “The ability of systems, units, or forces to provide services to and accept services from other systems, units, or forces and to use the services so exchanged to enable them to operate effectively together” (DODD, 1977) and through the years, interoperability tends to obtain a broader, all-inclusive scope of a repetitive feature pertaining to well-organized, collaborative organizations, as indicated in the definition of the European Interoperability Framework (EIF) (IDABC, 2008): “Interoperability is the ability of disparate and diverse organizations to interact towards mutually beneficial and agreed common goals, involving the sharing of information and knowledge between the organizations via the business processes they support, by means of the exchange of data between their respective information and communication technology (ICT) systems”. As information systems in enterprises and organisations evolve and become more complex, the need for interoperable operation, automated data interchange and coordinated behaviour of large scale infrastructures becomes highly critical. Apart from being a technical issue, interoperability challenges also appear at organisational and semantic levels, underlying the need for patterns and solutions that support the seamless cooperation among ICT systems, information and knowledge, organisational structures and people. Interoperability is recognised as a high-impact productivity factor within both the private and the public sectors, affecting the overall quality, yield time and cost of transactions, design and manufacturing operations or digital public services. Interoperability can dramatically decrease the costs, risks and complexity of information systems, being now the most important characteristic for organisations and their ICT infrastructures, representing a challenge to competition policies in Europe and America (Schratz, 2009). Yankee Group further advises IT departments to focus on interoperability technologies and skills as a core competency imperative, envisaging savings of more than one-third of the total cost of ownership - if they succeed in achieving business and technical interoperability (Yankee Group, 2009). 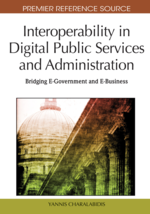 Gartner Group identifies the importance of interoperability in the public sector systems and processes, considering it a key element during digital public service provision (Gartner Group, 2008). However, since projects involving integration, interoperation and interoperability have been conducted from different vantage points, are typically multi-faceted, complex and run a high risk of failure (Scholl & Klischewski, 2007, Pardo 2007).